Welcome to the Hershey Heights Community Page. Below is a list of some of our favorite local spots we hope you will enjoy. Hershey Heights is proud to be in the Derry Township School District, one of the most notable school districts in the state. In addition, the Milton S. Hershey School is located nearby in Hershey. Penn State Harrisburg, Harrisburg Area Community College (HACC), and Widener Law School are also nearby. At Hershey Heights, we are located close to many employers and companies. Just a quick commute to I-83, I-81, I-76, 422, and 322, you can live and work where you love! Some local employers to mention are Penn State Hershey Medical Center, Hershey Company, Giant Center, Fort Indiantown Gap, and the PA State Capitol. Watch for announcements, local events, and our popular resident events. Save the Date! 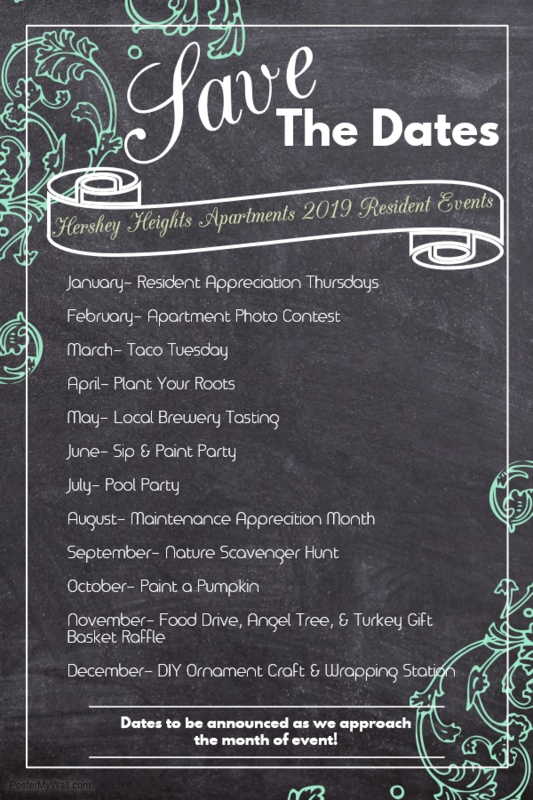 Our 2019 Resident Events have been Planned!